While outside of the 850, I wanted to pass along my quick review of a nearby-ish venue. Depending on what part of the 850 you are coming from Biloxi is either a short drive or a long road trip. I went for the Stone Temple Pilots concert and was overall impressed with the venue at Hard Rock. I had some questions along the way, since I had never been there before, and had a hard time gathering the information I wanted before the show. The venue is entirely inside, including where the line for the doors is. Your tickets might say that the doors open at a certain time, but if the line gets in the way of the casino, then the doors may open sooner. For my show the doors were supposed to open at 6:30, but we got in a little after 6pm. It is worth paying extra for the front floor tickets if you really want to be in the front. There was a barricade between the front floor and the back floor, and security checking tickets on the way in. Per a random newspaper article I stumbled on online the venue holds 1200 people standing. So seated shows almost always sell out really fast – and most standing shows do sell out as well. Don’t wait too long to order your tickets if it is a show you want to see. The entire venue is small enough that you would get a really great view from the balcony seats. It is also a tall enough stage that everyone seemed to have a pretty good view. The stage is a nice in-between size. Enough room for a band to move around, but small enough that you can see everything. Hard Rock does have giant screens on each side, which was a nice touch for a venue this small. Here is the one really interesting point. 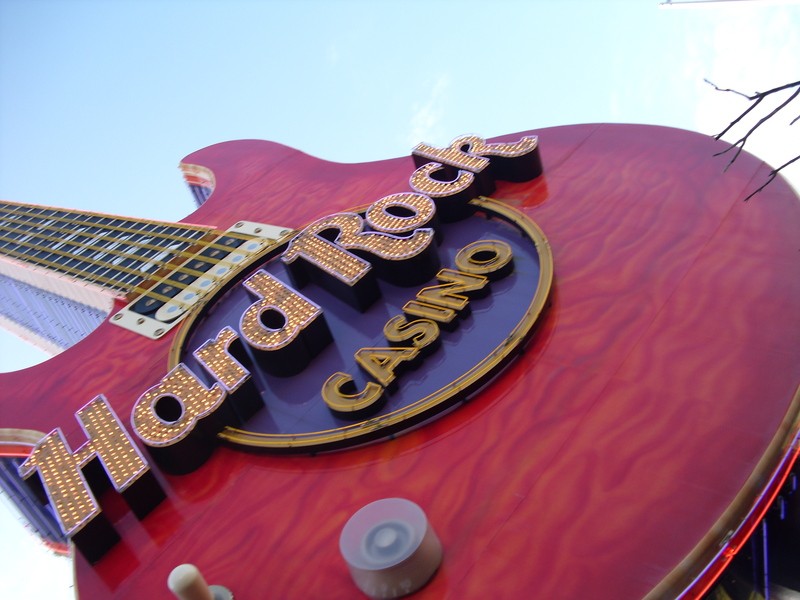 The line to get in the doors forms inside the Hard Rock Casino, so most people are in the casino before the show – not waiting in line. I got to the venue at 3pm-ish. I didn’t get in line until 5pm and I still was among the first 10 people or so in the door. Now of course the word of caution here is every show will be very different with line waits. But, most people can’t resist the urge to gamble a little before the show. The line didn’t really get going until about 5:30pm, but once it got going, it formed very fast. There is another but here too, at least for my show there was a big wait between the doors opening and the show starting. So for the first 30+ minutes inside the venue the place was pretty quiet. From ease dropping on conversations, some people were able to weave their way into the 3rd row or so at about 7pm. It wasn’t until 8pm-ish that the venue really started to feel packed for the sold out show. A general note of caution: No two shows will be exactly the same. My time frames here are not exact, as I didn’t wear a watch because I knew I would check it every 2 minutes. It’s that whole thing about being aware of the time sometimes makes time feel like it passes slower… When I contacted Hard Rock for a little help with a concept of what lines can be like I got a very vague email back. The people at the check-in counter suggested that lines starting really early wasn’t that common, but does happen. So that is why I have posted so much about what this show was like, maybe it will be helpful for someone else. Would I go back? It is a long way to travel, but yes, for the right band I would. It is wonderful to see a big touring act you love in a small setting like Hard Rock Live, and for those on the east end of the 850 it isn’t that far to travel. My advice to getting front row? Early is always good, but if you gamble at all before the show make sure you keep an eye on the line!